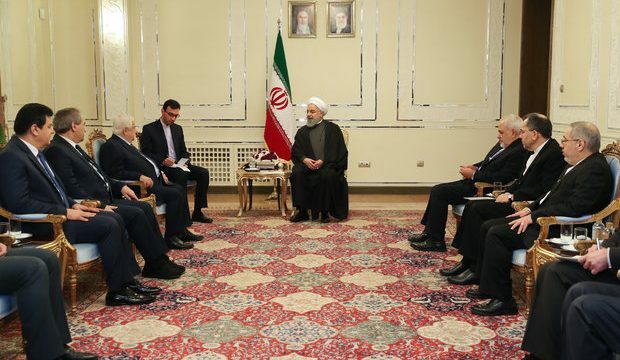 February 7, The Iran Project – Syria’s Foreign Minister Walid al-Muallem at the head of a delegation arrived in the capital Tehran on Tuesday (Feb. 5) for a two-day visit upon an invitation by his Iranian counterpart Mohammad Javad Zarif. Muallem’s stay in Tehran features talks with senior Iranian officials including Foreign Minister Mohammad Javad Zarif, President Hassan Rouhani, Parliament Speaker Ali Larijani, Secretary of the Supreme National Security Council Ali Shamkhani and Ali Akbar Velayati, Leader of the Islamic Revolution Ayatollah Seyyed Ali Khamenei’s special adviser on international affairs. 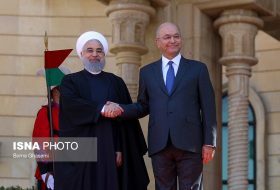 Muallem’s official visit to Iran was within the framework of the continuous coordination and consultations between Syria and Iran. During a meeting with his Syrian counterpart, FM Zarif slammed the Israeli regime’s warmongering in the region and its support of terrorism and said the Zionists are putting all-out efforts to disturb the peace in Syria. 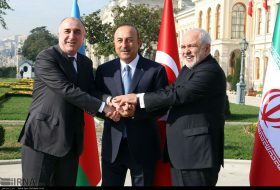 Zarif stressed the need for maintaining unity, coordination, and better cooperation among the regional countries to counter such acts of terrorism. The top Iranian and Syrian diplomats discussed ways to improve bilateral relations and the latest developments unfolding in Syria. 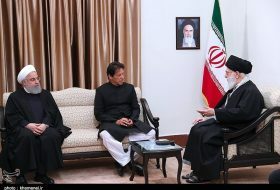 In a meeting between the Iranian president and the visiting Syrian foreign minister, both sides hailed each other’s success in defeating the United States’ plots targeting the two nations and the entire Middle East region. 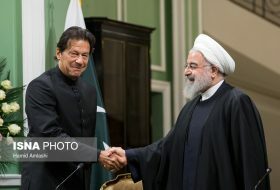 The Iranian president praised bilateral ties as “stronger than ever”, but said the two sides still needed to enhance their cooperation towards eliminating the remaining problems facing the Arab country. In a meeting with visiting Walid al-Muallem, Ali Larijani said that the bilateral relations between Iran and Syria are growing, and expressed hope that the growing trend of relations would continue. 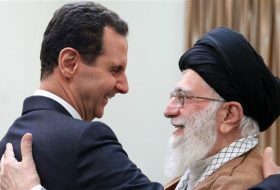 The Iranian parliament speaker stated that Iran is pleased with the progress made regarding Syria’s political issues, as well as the fight against terrorism while stressing that the Syrian people’s resistance against adventures of the enemies has been fruitful. In turn, the Syrian foreign minister congratulated the anniversary of the victory of Iran’s Islamic Revolution, saying that the revolution had a positive impact on the whole region. 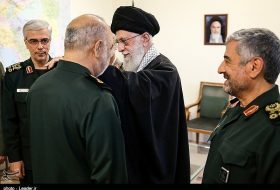 Also, Muallem hailed Iran’s help in the victory against terrorism, noting that the victory over terrorism has angered the Israelis and Americans. The foreign minister further condemned the unjust US sanctions on Iran, assuring the Iranian side that the sanctions will fail. In a meeting with top Syrian diplomat, Ali Shamkhani said Iran, as it stood by Syrian government and nation during the fight against terrorism, will spare no efforts in providing help and aid to them during the reconstruction period, as well. Shamkhani said Iran-Syria cooperation to combat Takfiri terrorism has led to undeniable achievements for the region and international security, and this process will continue until the end of the crisis in the country. The Syrian Foreign Minister Walid Muallem, for his part, presented a report on the latest economic developments, saying “pursuing a political path to resolve the crisis is a very important and the Syrian government will hold talks with the unarmed opposition groups, who are willing to maintain the integrity of the country. 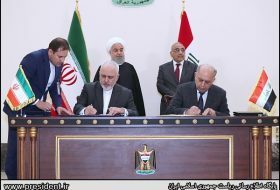 Syrian foreign minister also thanked Iran for their advisory help in fighting terrorism, saying Iran has stood by Syria since the very beginning of the crisis in the fight against terrorism. Speaking to reporters following a meeting with Syria’s FM, Ali Akbar Velayati praised Tehran-Damascus ties as “strategic” and said Syria’s victory was, in fact, a triumph for the resistance front. “The region’s reactionary triangle has suffered defeats against the Syrian nation, and Americans must leave Syria whether they like it or not,” he added. 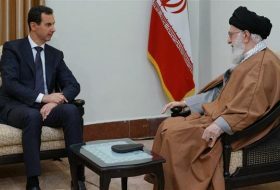 It should be noted that Tehran has been lending military advisory support to Damascus since 2011 when the Arab nation found itself in the grip of militancy and terrorism fueled and funded by the US and some of its Western and regional allies.